A tweet by London Ambulance Service (LAS) went viral last week, with 1.7 million impressions, nearly 10,000 retweets and plenty of celebrity engagement, as well as being name-checked across national media and broadcast channels. 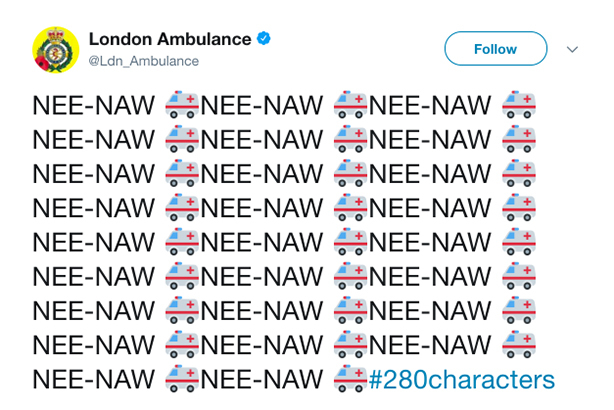 Other UK emergency services were quick to get in on the act with their versions of NEE-NAW, complete with their own distinctive emojis. Nice, but we prefer NEE-NAW ? ?NEE-NAW ?? NEE-NAW ?? NEE-NAW ?? NEE-NAW ?? NEE-NAW ?? NEE-NAW ?? NEE-NAW ?? NEE-NAW ?? NEE-NAW ?? NEE-NAW ?? NEE-NAW ?? NEE-NAW ?? NEE-NAW ?? NEE-NAW ?? NEE-NAW ?? NEE-NAW ?? NEE-NAW ?? NEE-NAW ?? NEE-NAW ?? NEE-NAW ?? #280characters #FixedIt ?????? NEE-NAW ? ?NEE-NAW ??NEE-NAW ? ?NEE-NAW ??NEE-NAW ? ?NEE-NAW ??NEE-NAW ? ?NEE-NAW ??NEE-NAW ? ?NEE-NAW ??NEE-NAW ? ?NEE-NAW ??NEE-NAW ? ?NEE-NAW ??NEE-NAW ? ?NEE-NAW ??NEE-NAW ? ?NEE-NAW ??NEE-NAW ? ?NEE-NAW ??NEE-NAW ? ?NEE-NAW ??NEE-NAW ? ?NEE-NAW ??NEE-NAW ? ?NEE-NAW ??NEE-NAW ? ?NEE-NAW ?? There was friendly competition among social media managers as to who had the best Twitter NEE-NAW, as well as sparking some niche debate about which emergency services had the loudest sirens in real life. It's actually the pumps that are louder! Using a slightly different siren to the ambulance and police services it can be heard from s further distance and at a higher volume and a slightly lower pitch! Call me a geek ?????? British Transport Police joined the conversation with its own distinctive take, followed by RNLI and London Air Ambulance, with its most popular tweet ever, making the conversation one of land, air and sea. Well played, only you could pull off CHOO CHOO and NEE NAW! Fire and police services from Canada, as well as the New Zealand police service, joined in as the conversation went global. Lauren Smith, the digital media officer at LAS who posted the original tweet, joined the comms team in April 2016 and looks after the service’s website and staff intranet, as well as working on social media. She said: "We have been completely surprised by the popularity of NEE-NAW, the ever-growing thread, and how far it’s travelled – we’ve had messages from emergency services from as far as Canada and New Zealand. Even 48 hours on, we’re still being inundated with tweets and messages from people from around the world who are loving the thread and joining in." LAS said its original tweet has received 1.7 million impressions and engaged 94,000, with more than 28,000 likes, nearly 10,000 retweets and 470 replies, so far. In addition to the reach the tweet garnered by being part of a wider conversation with other emergency services, it gained further traction due to endorsement and retweets by politicians, journalists and, most notably, the author JK Rowling with her 13 million Twitter followers. Smith continued: "I jokingly said to my colleagues that if JK Rowling likes the tweet, we will have definitely made it. Safe to say, there was a lot of excitement when I spotted that she had. Going viral has definitely been on my bucket list – I think I can tick that off now." In addition to celebrity engagement, the conversation attracted the attention of mainstream media, including The Guardian, The Poke and Huffington Post, as well as the London Evening Standard, which all ran stories helping the original post and thread gain even more popularity. Further afield, the Mumbai Mirror also ran a story on the viral social media thread. The thread even warranted a joke on Channel 4’s current affairs comedy show The Last Leg and an accompanying tweet from the channel’s social media account. Smith, who also looks after the service’s award-winning staff Facebook account, added that the tweet had also served as a great piece of internal comms. She said: "It was brilliant to see other emergency services, charities and other public sector organisations getting involved. It has also gone down incredibly well with our staff, who have been sharing it with their own friends and followers, and some have even said it has made them feel proud of where they work."